I’m sure any parent can agree that when choosing their children’s vitamins, brand reputation, ingredients, and organic and all-natural nutrients are important criteria. If you want to cut to the chase, SmartyPants Complete gummy vitamins scored high marks in all categories and are our top pick. These delicious gummy vitamins provide children with 10 nutrients including vitamin D3, B12, E, and Omega-3 fish oil. Whenever possible it is recommended to get the vitamins and minerals your child needs from the food they eat. However, anyone who has children knows that sometimes that isn’t as easy as it sounds. Whether it’s because the child doesn’t want to eat or they are sick or they are extremely picky, there are several reasons that can prevent your child from getting all the needed vitamins and minerals from their food. For this reason, it is a good idea to give your child a multivitamin that will help them get the recommended daily allowances of nutrients they need to grow up strong and healthy. Because children grow so fast when they are young, having a good quality multivitamin can help them be as healthy as possible during this fast growth stage. With the large selection of children’s vitamins on the market, trying to decide on the perfect bottle for your kids can be daunting. With the right knowledge, sorting through all the choices becomes much easier. There are things you want to look for that will narrow the field of choices and help you select the vitamin that will give your child the extra nutrition they need. 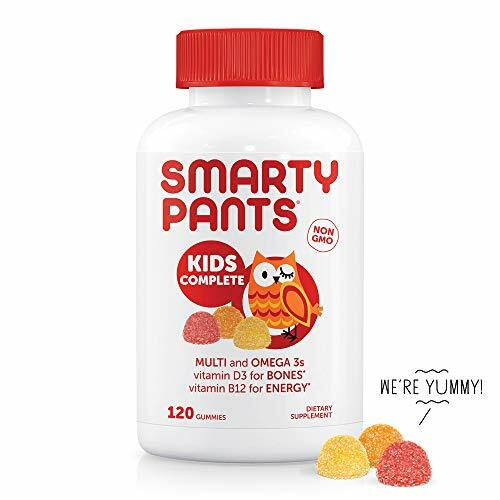 The vitamins and minerals in the SmartyPants children’s multivitamin are not every vitamin that a child needs, they concentrated on the vitamins and minerals that are the hardest for children to get from the foods they eat. They focus on providing the forms of these nutrients that are absorbed the best and easiest by the body. SmartyPants are GMO free. There are no artificial flavors, preservatives, or colors in these vitamins. In addition, they are allergen, casein and gluten free. Add that to the fact that they contain no wheat, dairy, eggs, soy, tree nuts, fish allergens, peanuts, or shellfish, and you have a vitamin that is truly healthy for your child. All of the vitamins that SmartyPants sells have been put through testing with a third party lab for potency as well as purity. The nutrients and dosage that your child needs is spread among the 4-gummy dose recommendation. This prevents the vitamins from tasting fishy or vitamin-y. The organic sugar that is used prevents the gummies from sticking together in a big clump in the jar and also won’t stick to your child’s teeth. Flintstone vitamins have been around for decades. They are pediatricians’ number one choice for chewable vitamins for children and have been for a very long time. They contain 12 vitamins and minerals that help the development and long term growth of children. They have as much iron and vitamin C as 7 ounces of liver and a whole orange. There are 8 well-known Flintstone characters in the bottle including Fred, Wilma, Pebbles, the Great Gazoo, Dino and others. The child-resistant cap prevents children from getting into the bottle when they shouldn’t but they should still be kept up out of reach of children. 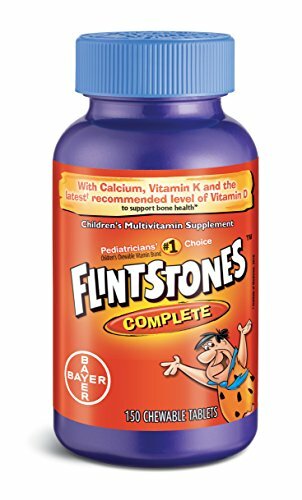 Children as young as 2 years old can take Flintstone vitamins. Ingredients included in these popular vitamins are Riboflavin, Thiamine, Vitamin A, Beta Carotene, Folic Acid, Biotin, and others. Your child will get many of the needed nutrients that they need to be strong and healthy. These vitamins don’t replace eating healthy and parents should give their children fresh fruits and vegetable and whole grains and lean meats regularly. However, when that isn’t possible, Flintstone vitamins will help supplement their diet. There are two packs in this offering. Natures Plus is another well known name in vitamins. This Animal Parade assortment of children’s vitamins supplies the nutritional supplements and protection that every parent wants to give their child. There are 180 tablets in this bottle. The great taste and fun animal shapes makes these vitamins fun and easy for children to take. With each chewable tablet your child will get 16 different vitamins and 8 minerals. Included in these terrific vitamins and minerals are healthful, delicious foods including carrots, spirulina, broccoli, whole brown rice and spinach. Natures Plus knows that adding whole foods to the nutrients helps Animal Parade provide children with a complete dietary supplement that tastes great and really benefits your child’s health. The serving size is 2 tablets each day. Your child will enjoy delicious cherry, grape and orange in this bottle. They are hypoallergenic and vegetarian as well with low sugar, low carbohydrates and only 10 calories. There are many brands and types of children’s vitamins on the market. Sorting through all of them can be a real time consuming job, especially if you’re not quite sure what you’re looking for. The top rated children’s vitamins that we have featured above are all excellent products from well known brands. They provide the different nutrients and minerals that your child doesn’t always get in the food they eat, especially if they are picky eaters. Children’s vitamins are not supposed to take the place of healthy food but they can help fill in the gaps that not eating perfectly can leave. Since no one can really and truly eat perfectly, it’s great for parents to have something as high quality as the three different brands here are. Continue reading our buyer’s guide below for even more information on children’s vitamins and how to choose the right ones for your children. This information will help steer you in the right direction so you make the right selection for your children’s needs. Which Kids Need Vitamin Supplements? In today’s hectic world and with the huge influx of processed food and fast food choices, it’s not always easy to make sure your children have regular meals that are well balanced. Because of this, pediatricians usually recommend taking a good children’s multivitamin. The following list contains some reasons that your child could be a good candidate to take a children’s vitamin and mineral supplement. Children that have asthma or that have digestive issues of some kind. This is even more important if they are on medication for their conditions. If your child IS on medication, talk to the pediatrician first to ensure that you choose what they recommend. Children that eat a lot of processed and convenience foods as well as fast foods. Children that are on a vegetarian, vegan or dairy-free eating plan. They may need an iron or calcium supplement as well when on a restricted diet of some kind. Children that drink a lot of soda. Soda is known to take the vitamins and minerals from a child’s body. There are several minerals and vitamins that are crucial for a child to have enough of to ensure healthy growth. We have listed these below. B Vitamins – All of the Bs: 2, 3, 6 and 12, help provide energy and healthy circulation. It also aides the nervous system and helps metabolism too. Vitamin C – This important vitamin helps with having healthy skin, muscles, and connective tissues. Vitamin A – This vitamin promotes healthy and normal development and growth. It also facilitates bone and tissue repair as well as healthy eyes and skin and builds immunity responses as well. Vitamin D – D is important for healthy tooth and bone formation and assists with the absorption of calcium. The best way to get adequate sources of vitamin D is through sunlight exposure. Calcium – Calcium is still responsible for healthy teeth and bones as your child grows. Iron – This mineral builds muscle and is vital for the production of healthy red blood cells. It is easy for children to become deficient in iron so keep an eye on this. Do All Children Need Vitamin Supplements? There are some differences of opinion as to whether all children need a vitamin and mineral supplement. Depending on who it is, some state that a child should only have vitamin supplements if the pediatrician recommends it. Taking a vitamin supplement won’t hurt a child as long as it doesn’t give them more of the RDA of any of the vitamins and minerals. It is a good way to make up for any dietary deficiencies your child might have. Below are some opinions that many experts agree on. Giving your child a daily vitamin supplement won’t hurt, just don’t exceed the RDA for any of the vitamins or minerals. If your child is a vegetarian or vegan or has food allergies, a supplement can help compensate for what they aren’t getting. Keep in mind that supplements are not a substitute for food. Ask the pediatrician about giving your child any form of vitamins or minerals if they are on any medications to avoid problematic drug interactions. Instead of fighting over the food your child won’t eat, get into the habit of giving them a vitamin right after the meal. Use chewables or gummies which children love. Always keep vitamins out of reach of children so they don’t eat them like they are candy. Unless directed by a pediatrician, wait until your child is 4 before you start. Vitamin and mineral supplements are designed to provide the nutrients that are not obtained in the foods they eat. Because the typical children’s diet doesn’t always match what they SHOULD eat, you can make up for the different vitamins they may not be getting enough of. With all of the different choices and types of children’s vitamins on the market, there are plenty to look over so you can make a decision that will provide what your child needs. It’s not hard to choose a vitamin supplement for your child if you are aware of the things that a good supplement contains. You don’t want to fill your child up with chemicals, which isn’t necessary with all of the children’s vitamins, many of them completely all natural and organic. The best way for your child to get their nutrition is from whole foods that are not cooked in less than healthy ways. (Such as fried). Since that is not always possible, choosing the right vitamin supplement with the right amounts of the crucial nutrients a growing child needs is the way to go. This buyer’s guide provides the types of vitamins that a child needs the most, how to determine if your child needs, and some safety tips as well. You have everything you need to make an informed decision that you can stand behind and that your child will enjoy taking each day.